Air Science® has designed a variety of vented and filtered storage cabinets useful for storing noxious or odorous chemicals. These cabinets minimize health and environmental risks in handling chemical vapors and residues, VOCs and general laboratory functions. The Air Science Multiplex™ filtration system protects the safety of personnel during use, maintenance and decontamination. 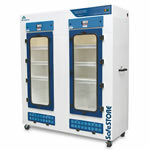 The Safestore Series of vented filtering storage cabinets offers an economical solution for storage of toxic, noxious and odorous chemicals in the laboratory. Air Science Vent-Box ductless filtration systems are modular ventilation and filtration units designed to protect laboratory personnel from chemical vapors found inside of stand-alone chemical safety cabinets. Easy Installation. Cabinets are self contained. Set-up, operation and filter maintenance are straightforward. Energy Efficiency. Because filtered air is returned to the room, no demands are required of the facility HVAC capacity for make-up air. Select one of our storage cabinet lines above to learn more, or contact us today for a customized quote based on your application.